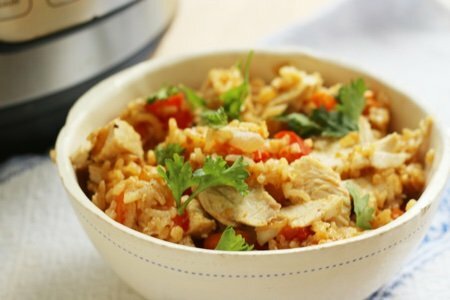 This light Instant Pot chicken and rice is a keeper. Who doesn’t love chicken and rice? I’m pretty sure it is a standard for most households as it is so comforting. Almost any problem can be solved with chicken and rice. My birthday requests included a comment asking for more Instant Pot recipes. I’ve had my Instant Pot for a while now and I keep making chicken recipes in it. I used the pressure cooker function for green salsa chicken in an instant pot and the slow cooker function for healthy slow cooker butter chicken. The reason why you would want to use the Instant Pot pressure cooker function for chicken breasts is that it helps seal in the juices so you don’t get dry, rubbery chicken. Not only that but it is INSTANT!! All you do is put the stuff in the pot and press a few buttons and you can walk away. Don’t try that with a saute pan. I never use the preset buttons on my pot. Typically, I hit MANUAL and then the amount of pressure and the time. It starts automatically. This recipe features a slow release so you allow the rice to soak up the liquid after it cooks. Trust me, it works. No crunchy rice! This time, I had to push the buttons gingerly because of an injury. 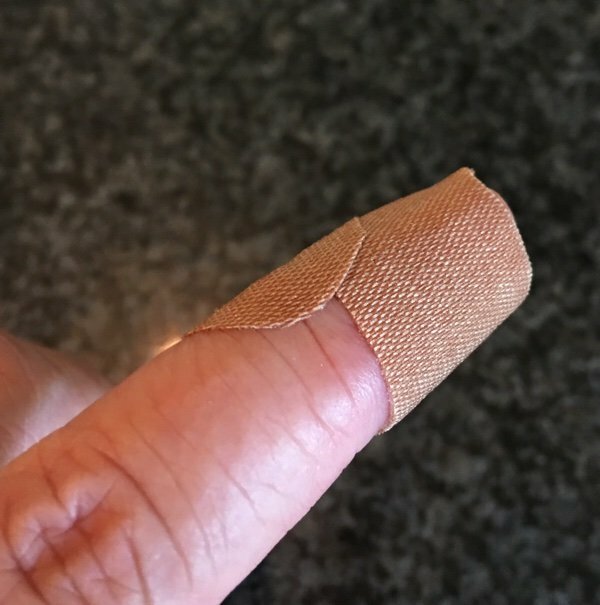 As you can see, my very sharp Chef’s knife slipped off the bell pepper and into my finger. Note to self - cut up peppers on the rough side!! I was on the slippery skin side when I cut myself. This finger is also the one I use to type and handle my computer mouse. Waaaah! As long as you don’t cut yourself, you will love this recipe. I made it lighter by adding less rice than a regular recipe. This way it is mostly protein and veggies. Feel free to add olives, capers, lemon zest, or any fresh herbs you have hanging around to add more flavor. Chicken and rice can be a bit bland. 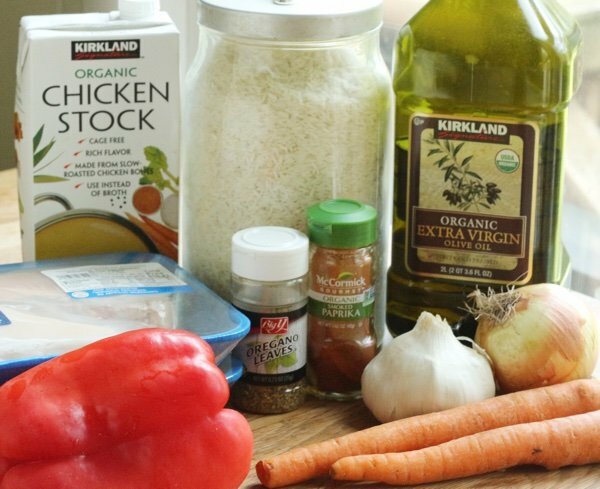 How do you make chicken and rice? Heat Instant Pot on the saute setting. Add olive oil and onion and cook until translucent (about 4 minutes). Stir in garlic, oregano, and smoked paprika and cook for 1 minute. Add rice, chicken broth, carrots, pepper, and chicken breasts and set the Instant Pot on manual high pressure for 8 minutes. After cooking has completed, all the pot to sit for 10 minutes to slowly release pressure. Remove chicken breasts and slice thinly. Mix chicken in with rice, adjust seasonings, and serve with chopped parsley. 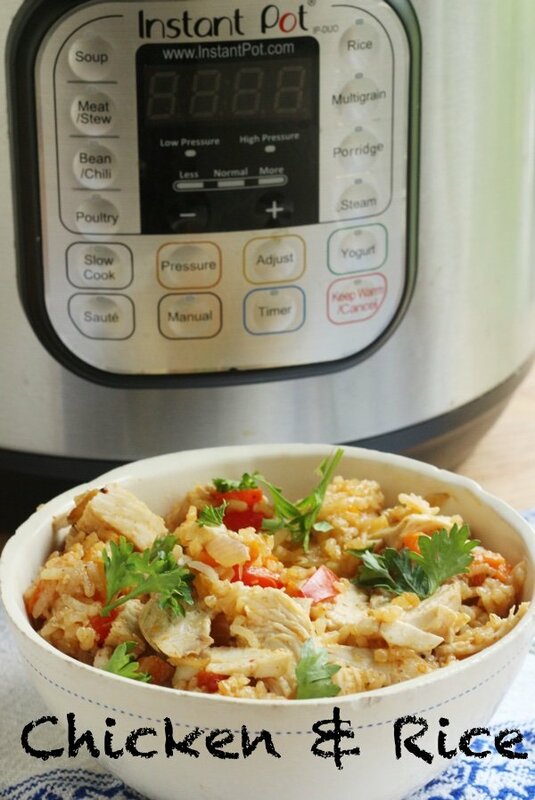 Do you add the rice to the instant pot when you add the chicken? In your recipe, the rice sort of just magically appears at the end, not clear when it gets cooked. @karen - Magic? No, a mistake. I meant to add the rice with the chicken broth. It cooks with the chicken and is quite good! I have fixed the recipe above. Thank you so much for commenting. 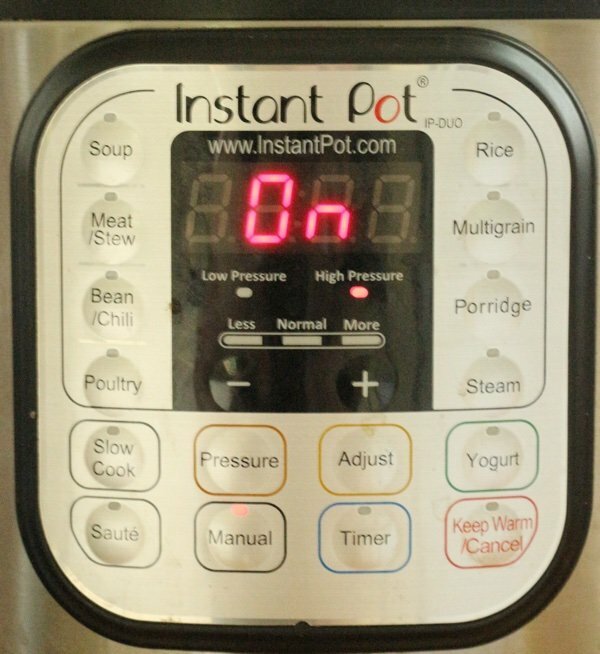 I am on the fence with instant pot. Only cook for two. We are 65 years old with an active lifestyle and a small kitchen. What size would I get. Yes a small amount of leftovers are OK (maybe 2 meals worth). Please help! Would love some advice. Thanks in advance. @STELLA - I would get the 6 quart because it doesn't make that much. You can only fill it 2/3 full because it is a pressure cooker. What I would do is find a friend with one and make a recipe in it. It is LARGE so you have to find space to store it. I am a fan but I do this for a living. Excellent question!! Thanks for this opportunity recipe. I just bought an ip and I use it at least 2-3 times a week. I got rid of my slow cooker and pressure cooker to justify buying another appliance. It also cooks great rice and I do "roasted " veggies in 4 min. Thanks for all the recipe ideas. My family is still hinting about how they enjoyed the cottage cheese waffles. Hubby reserved the last piece for breakfast next day. That's a keeper! I want to use brown rice. Any idea how much more liquid would be needed? Is it possible to convert instant pot recipes to a slow cooker version of it? Can't afford the instant pop right now but this recipe sounds wonderful. Thanks much! Slow cooker or in the oven? I don’t have an instant pop. How do you cook this recipe without an Instant Pot? I need to do it without it and play with it a bit. You can do something similar in the oven. I will post that recipe as separate one because I need to get it right before I suggest a way to modify this one. Thanks for the questions! @Beverly - for brown rice I would add 1/4 more water or broth and cook it for 3 minutes longer. I haven't tried it but this is where I would start. Thanks for your question. Am I missing something, when do you add the red pepper? I'll just add it after the onion.